Strange consistancy.....never really liked it....Mom made it a few times. Rennet is a culture that curdles milk. It's what's used in naturally made cheese to effect the process. In it's natural state it comes from the fourth stomach of a cow. Could never figure out what this was and so avoided it. Come to think of it never knew any kid that had it in his house, either. 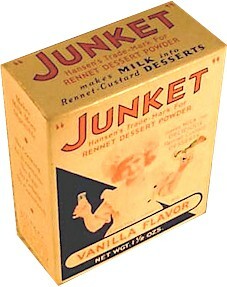 I think the word "junk" in the name was the turn off. This stuff was pretty bad. It had a grainy texture and failed to replicate American-style instant puddings. At the time my mother inflicted us with this fad, the only flavors were raspberry, butterscotch and vanilla, none of which were very accurate. More like pink, brown and off-white flavor. And sweeter than trifle. My mom used to make it for me too. I remember there was vanilla, chocolate, and an orange sherbet-like flavor. That was my favorite one. All I remember is that it was something made of 'rennet powder', whatever that is. My mom used to make this for us and I know I liked it, but I can't quite recall what it was like.